Marv, an IT manager of an e-commerce business and in-charge of controlling cloud computing cost of his department, has been facing a big challenge ever since his company’s cloud usage scaled up. He is finding it difficult to extract detailed information about which team member drove the increase each month and which application or resource caused the spike in AWS bill. He is also having a hard time figuring out what’s happening in the cloud inventory at the moment. His team of twenty, which consists of DevOps and CloudOps, are trying diligently to optimize the cloud usage. Challenges like these are a typical scenario in every IT set up today, irrespective of the size and vertical. As the cloud usage of a business grows, the infrastructural complexities grow proportionally and so does the complexity of the bill. Even though Amazon addresses this challenge with consolidated billing and tagging, IT managers, like Marv, still need to segregate development environment as well as testing accounts to identify cost leakages across different projects, departments, various applications running on AWS, etc. Moreover, how can he identify or analyze saving opportunities when he does not have visibility into complete AWS usage? 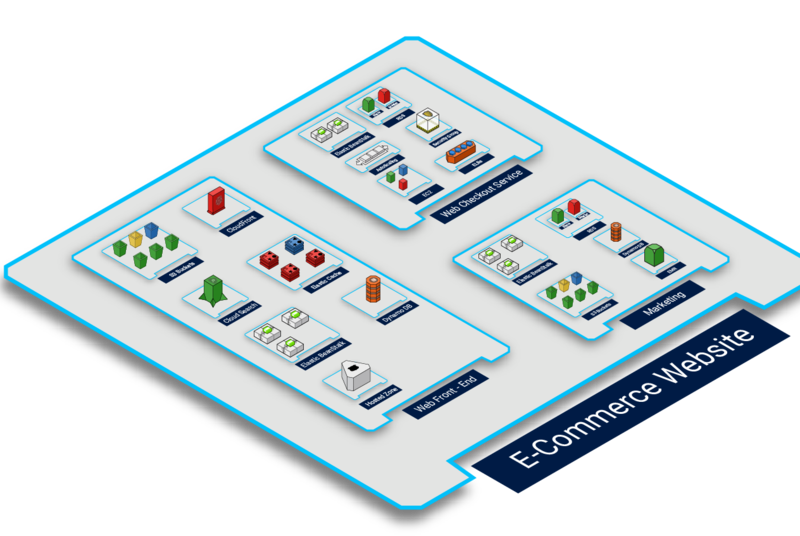 There’s a way out for Marv to resolve it — using TotalCloud Interactive Cost Analyzer, which maps the cost to actual AWS resources used for building the e-commerce site and renders them all on a visual and interactive console. The first stepping stone to achieve optimal cost savings while on AWS is to map the cost of each resource as well as the application as a whole, and also analyze resource utilization. With TotalCloud Cost Analyzer’s Group-View, Marv can dynamically group his e-commerce website’s resources, using multiple parameters, right from tag value, tag key and VPC ID to resource type and application, and start mapping the cost of these grouped resources to get a better cost perspective; and all these on a visually-rich interface. Marv can analyze spend on each resource or the complete application, and take corrective action. He can get real-time bird’s eye view of AWS spend for different resource groups. He can also drill-down with TotalCloud Cost Analyzer’s interactive zoom-in feature, with few mouse scrolls, up to each resource level and perform root-cause analysis. Watch this video to get a perspective of how TotalCLoud groups resources and helps you quickly analyze spend in seconds. From the video, you can observe that Marv can understand AWS spend at ‘group-level,’ with rich color codes denoting the spend for each group, namely Web Front-end, Web checkout service, and Marketing engine. 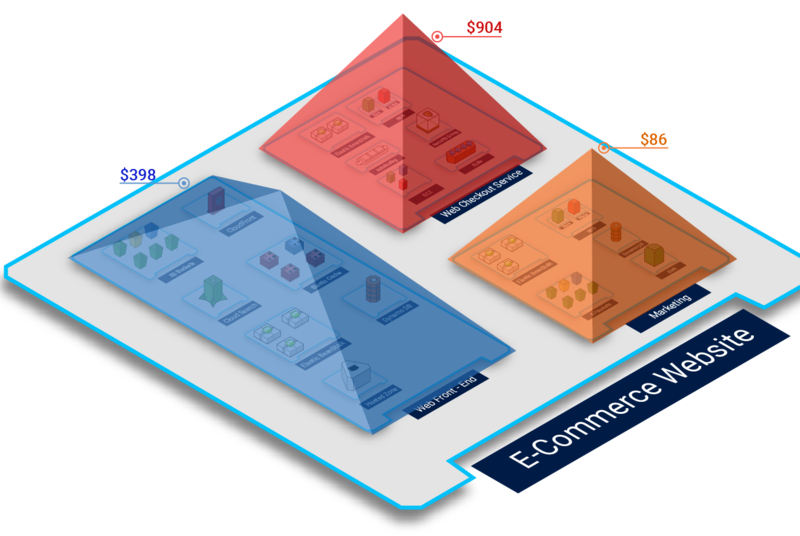 The above image shows TotalCloud Cost Analyzer’s Group-Level View for the above shown E-Commerce Website example. From the video, you can observe that Marv can quickly comprehend AWS spend at group of resources level, with rich color codes denoting the spend for that particular group of resources. 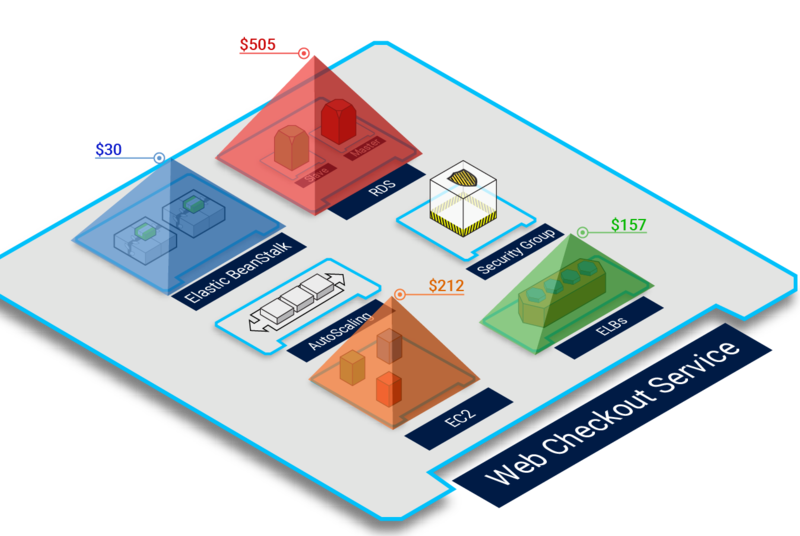 The above image shows TotalCloud Cost Analyzer’s Drill Down View for the above E-Commerce Website’s Web Checkout Service. TotalCloud Cost Analyzer can help Marv further drill-down into a particular application’s resource usage (for instance, the same e-commerce website’s checkout service), and understand the cost of the individual resource, visually. Best part, visually-rich color codes (denoting the cost of each resource) provide Marv with the first-hand information on AWS cost, which otherwise would have been difficult to comprehend with data-rich reports. 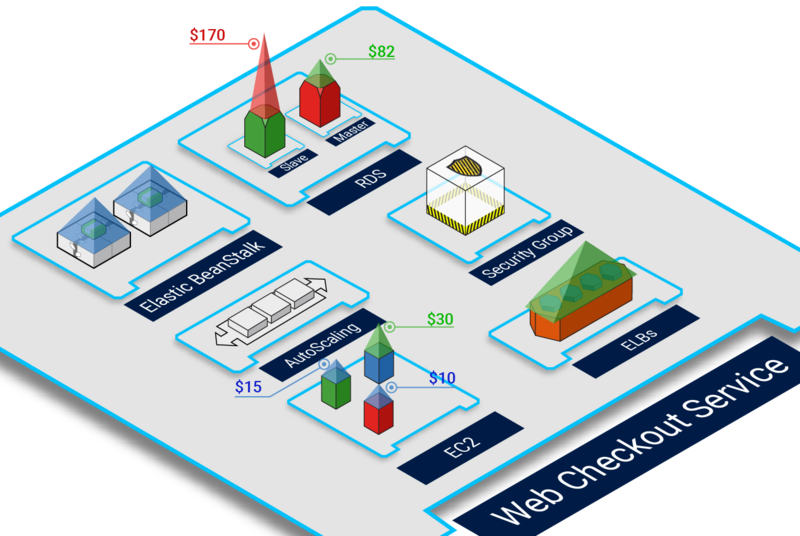 The above image shows TotalCloud Cost Analyzer’s Resource Level Cost Analysis for the above E-Commerce Website’s Web Checkout Service. Marv can also identify all the culprit resources and optimized resources at a glance and thus eliminate the need for bulky reports and dashboards to comprehend overall cost. Apart from getting a customized drill-down view of AWS spend, Marv and his team can understand current global spend, projected spend and the previous day’s spend in a snap with TotalCloud’s Globe View! 1. 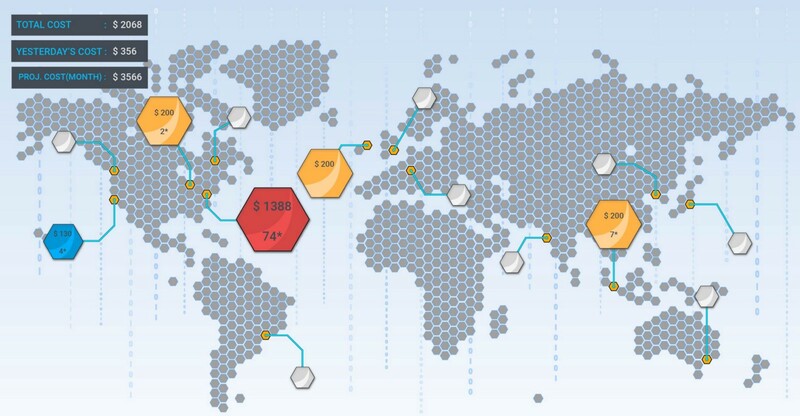 Understand AWS spend across regions with its global-view. 2. Get AWS spend visibility, according to their projects and applications hosted on AWS with its group-view. 3. Obtain complete cost perspective based on their business needs with its top-view. 4. Fetch AWS spend data at resource level with its drill-down view. In an on-demand, pay-as-you-go cloud world like AWS, it’s easy for costs to spiral out of control. But with TotalCloud’s powerful interactive and visual console IT managers like Marv and his DevOps and CloudOps team to take complete control over their AWS spend. Additionally, with real-time rendering of resources help them in making quick decisions and adjustments based on the current pricing of the instances. Are you one of those IT Managers like Marv, or a DevOps or a CloudOps engineer trying to figure out how to unlock maximum AWS cost savings. If you are, you need to try out TotalCloud Cost Analyzer.